Hate to admit it (due to my love of America’s Next Top Model) – but so far, so unimpressed with Covergirl mascaras. I really didn’t like the supposed ‘colour enhancing one I tried a while ago and now I feel let down with this one too. 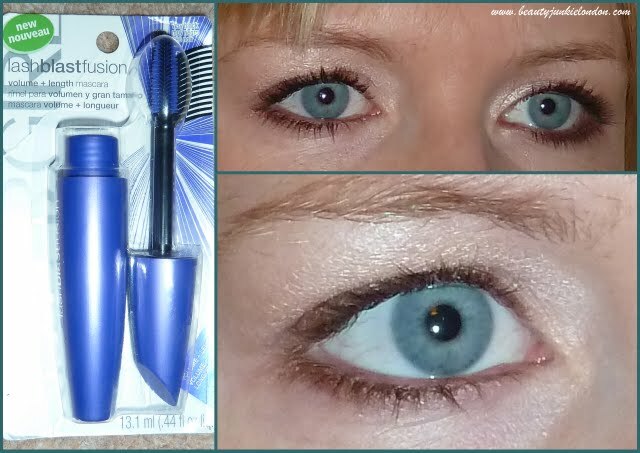 Lash Blast Fusion promises both volume and length, and I’m not completely convinced on either. It’s not the worst mascara I have ever tried – but it wasn’t great. When I look at the before & after pics I find it hard to see the dramatic difference that I expect from my lashes with & without mascara. Granted, in both pictures I have got other eye make-up on, so there is a bit more depth than usual – but still. Not blown away. Have you tried anything Covergirl? What did you think? The mascara doesn’t seem to have a great deal of impact at all, but I do want to have the chance to try some of their products due to ANTM too! Where did you buy the mascara from? Shipped from US or a cheap online retailer here? I bought this one when I was in NY in September but have another that I got my hands on via a swap. So cover girl has one more chance to impress me!! Hehe, funnily enough I absolutely swear by Covergirl mascaras, they’re some of the best I’ve ever used, which is handy as they’re so cheap! Whenever I’m in Canada or America I stock up on them cause I can’t bear to run out. However I haven’t tried this one or any of the other colour enhancing ones. I think I have a review of some covergirl makeup on one of my blogs, so you can see thee type I use atm, the name escapes me. It makes my lashes really long and is completely waterproof.